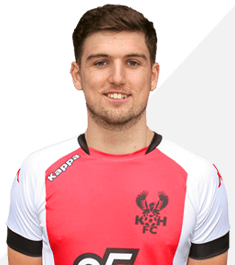 George Waring came to the Harriers on loan from Tranmere Rovers in January 2018 for the remainder of the season. George was a youth player for Stoke City from 2013 until the start of the 2017-18 season when he joined Tranmere. In between he has been out on loan many times to Shrewsbury Town, Oxford Utd and Barnsley and since signing for Tranmere he went to FC Halifax Town for a few months on loan. During his spell with us he scored four times in fifteen appearances. The following season he returned once again for another loan period. Waring left Tranmere by mutual consent a week after leaving us and joined Chester FC soon after.